As the Olympics casts its eye toward sports such as surfing and sport climbing, a traditional sport like equestrian fights to stay relevant, and according to one official, the sport must "change or die." On a sunny day at Spruce Meadows, in the shadow of the awesome, snow-capped mountains of southern Alberta, the knowledgeable and eclectic crowd gathers. Their ranks are measured by the tens of thousands. Horses of every size and shade vault powerfully at the command of riders who hail from Canada, the United States, Mexico, Lebanon, Russia, Brazil, Egypt, Japan, and the far-flung reaches of the planet. The grandiose kaleidoscope that is befitting of an international spectacle of sport is breathtakingly unmistakable. It is both awesome and impressive. And yet, on a weekend where the International Olympic Committee (IOC) has resolved to embrace a new roster of athletic endeavours designed to attract the attention of a younger generation of fans, there are rumblings. On the emerald–green turf under the big, blue sky there is the understanding that show jumping must keep itself grounded while making peace with the evolution of the Olympic program which now includes sports like surfing, 3-on-3 basketball, and skate boarding. "It's change or die," said John Madden, who runs a stable which has produced some of the best equestrians in the world, both animal and human. Included is his wife Elizabeth, (known as Beezie), who has won four medals — including two gold — over the course of her Olympic career. She is one of the top-ranked riders in the world and has been for at least a decade. "If we were ever to lose the ability to have our sport at the Olympics, I don't even want to think about the downturn it would cause for our entire industry," John Madden said with a grimace. "It would be complete devastation." Madden is also the first vice-president of the International Equestrian Federation [FEI], and has been instrumental in show jumping adopting a format change for the team event at the Olympics. The rule alteration calls for a smaller team — three riders instead of four — and every performance to count with no droppable score. Its proponents claim it eliminates what many critics saw as a cumbersome and complicated scoring system. "You tell me a sport that's been successful where you're confused about the score," Madden said. "People have to be able to tune in and instantly know who is winning and who is losing. If you can't count on that, how do you sell it?" While Madden and other like-minded folks in the equestrian world have been able to get the format change adopted and thus secure show jumping's place on the Olympic roster through the 2024 Games in either Paris or Los Angeles, many riders who favour tradition aren't happy. "All sports need to evolve to be in the marketplace," said Ian Allison of Spruce Meadows, who is also the president of the Alliance of Jumping Organizers. "You can change to respect tradition but also to engage a new fan base. This allows for more universality. People don't fully understand that there are 150 countries that have equestrian federations. This change means a greater opportunity for more flags to be represented and more show jumping teams to get to the Olympics." 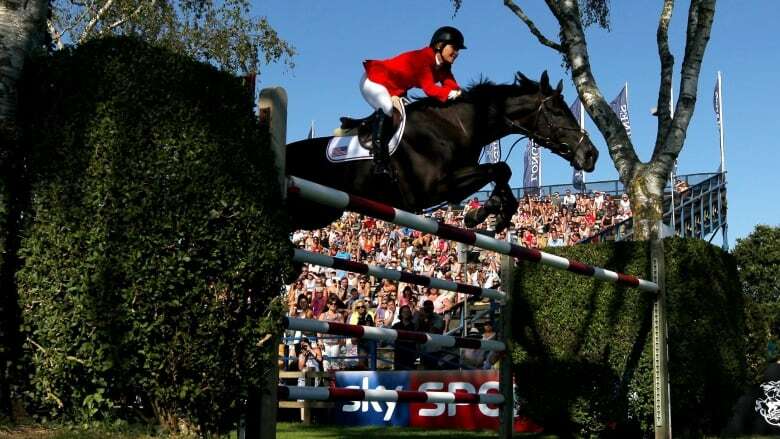 But there is more required than a rule change to ensure show jumping's long-term survival on the Olympic stage. IOC president Thomas Bach, through his Agenda 2020, has gone to great lengths to applaud the changing complexion of the Games schedule, which now includes a growing number of sports such as half-court basketball, sport climbing, freestyle BMX cycling and karate. These are sports which are played in cities and easily accessible to a vast and youthful audience. "Universality is essential," Madden said. "We have to grow our sport in places like Asia. We have to find a way to move horses more freely around the world and expose more people to what these athletes can do." She's a 24-year-old rising star who holds dual American-Japanese citizenship and who chooses to compete for Japan because there's a better chance she'll make that team for the Tokyo Olympics, but also because there's a way to spark change. "Horse racing is huge in Japan, but show jumping is very minor," Polle said. "But it is a beautiful sport and it's unique. There's potential because it's exciting. The Olympics in Tokyo offers an opportunity to grow awareness." One card that all of the Olympic equestrian disciplines, which include show jumping, dressage and cross-country, have been able to play is the growing requirement that sport be seen as striving for gender equity. Because of the inclusion of mixed-gender relays in swimming, athletics and triathlon as well as the new sports, nearly 49 per cent of the athletes at the Tokyo 2020 Games will be female. That's more than at any time in history. "Gender equity is what Agenda 2020 is all about, and we are the champions of gender equity," Madden said. Indeed, equestrian sport, which has been at every edition of the Olympics since 1912 in Stockholm, is now the only sport in which men and women compete on the same field of play, against each other, and for the same gold medal. It's been that way in show jumping since the 1956 Games in Melbourne, Australia. "I've never thought that I'm a young woman and therefore I'm at a disadvantage," Polle said. "In riding I have never been denied an opportunity because I'm a woman. Ideally that's the way it should be for all of sport." While it's impossible for men and women to compete directly against each other in every sport because of physiological reasons, it is to horse sport's credit that it has long been a trailblazer in nurturing its champions regardless of gender. That applies to riders as well as horses, where stallions and mares have both won Olympic medals. "We don't care if it's a man or a woman. It's a competitor. It has always been that way with our sport and that's what matters," Madden said. "The rules that we have adopted in show jumping are a victory for high quality, ethical sport. That's what we're supposed to be about. We've worked very hard to take Agenda 2020 very seriously, dissect it, and present ourselves well to the IOC." At the national show jumping tournament, the thrilling horse sport which Spruce Meadows has become famous for unfolds with no small measure of drama. There are crashes, dashes, graceful flights by majestic beasts, and a bevy of standing ovations. Men and women have found their way to the winners' circle, so too have athletes from a variety of nations and many different age groups. It's a diversity of talent which performs in front of the appreciative grandstand. It all feels so … Olympic. "Competitors in this sport target the Olympics," Madden said. "I know every little girl who gets into riding dreams of going to the Olympics and not of winning a lot of money." For Polle, keeping that dream alive means that show jumping must change with the times and allow the sport she loves to become more accessible to more people. "If that's the way we can keep our sport in the Olympics then there's no question I'm for it," she said. "For me it's always been the Olympics. They are the biggest goal and the pinnacle of everything you work for."